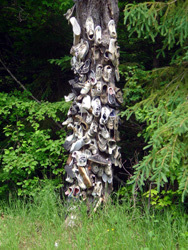 Strange occurrences in the Muskoka region of Ontario have been happening with a greater frequency as the only remaining signs of missing children are their shoes. A number of families interviewed all speak of the same story. Their children were going out to play by the tree covered in shoes and they never returned. There are no signs of any struggle, no witnesses of strangers in the area, no ransom notes, just the shoes of the children nailed or hung in the tree. Randy Moller, a leading specialist in the Occult and Professor at McMaster University, says that these trees have been recorded throughout history and are known to those who practice the dark arts as Man Eaters. Randy referenced drawings of these trees with sandals and clogs nailed to them as early as 200 BC. Professor Moller said the trees are starting to multiply at a greater rate and fears that if people do not heed his warnings there will be no children left in the world! Remember if you are going to the cottage or are driving by one of these man eating trees on the weekend do not stop to take a picture or even approach the tree otherwise it might be your shoes we see nailed to the trunk.